The militant group has made a number of gains in recent months. 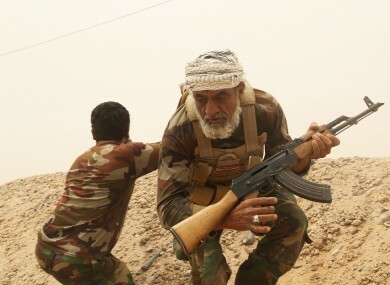 Fighters from the Badr Brigades Shiite militia clash with Islamic State group militants at the front line on the outskirts of Fallujah, Anbar province, Iraq. THE UNITED STATES has spent $2.7 billion (€2.4 billion) to date in its campaign against the so-called Islamic State (IS), new figures released by the Pentagon show. That works out at more than $9 million (€8 million) per day. About two-thirds of that figure is spent on the Air Force, according to the BBC. Yesterday, the House of Representatives approved a $579 billion (€516 million) defence spending bill that offers a slight pay raise to US troops, but reflects deep divisions on budget priorities and whether President Barack Obama needs new war powers to fight IS. The vote was 278 to 149 in favour of the bill, which drew stiff opposition from Democrats because it uses a war-fighting account to raise defence spending next year. The measure gives Obama roughly all the money he requested for defense, but does so by hiking the war-fighting account — which is not subject to congressional spending caps — by almost $40 billion (€35 billion). This week, the White House announced another 450 advisers will be sent to Iraq in a bid to reverse gains by IS. This brings the total military personnel there to 3,500. IS seized Ramadi, a predominately Sunni city near Baghdad, last month. Email “The US spends €8 million PER DAY fighting Islamic State”. Feedback on “The US spends €8 million PER DAY fighting Islamic State”.